We demonstrate how the use of synchronization primitives and threading policies in distributed object middleware can lead to dead- locks. We identify that object middleware only has a few built-in syn- chronization and threading primitives. 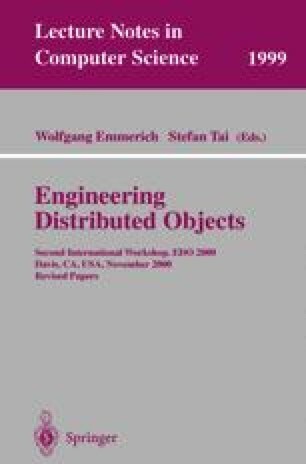 We suggest to express them as stereotypes in UML models to allow designers to model synchronization and threading of distributed object systems at appropriate levels of ab- straction. We define the semantics of these stereotypes by a mapping to a process algebra. This allows us to use model checking techniques that are available for process algebras to detect the presence or absence of deadlocks. We also discuss how the results of these model checks can be related back to the UML diagrams.